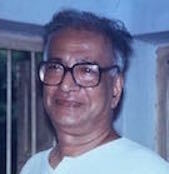 Kalpathi Ganpathi Subramanyan was born in 1924 in Kerala. In 1943 ‘Mani Da’ as he is fondly called, received his degree in B. A. (Hons.) in Economics from Presidency College, Chennai. From 1944 - 1948 he studied at Kala Bhavan, Visva Bharati University, Santiniketan in West Bengal. In 1955 & 1958 K.G. exhibited solo in Delhi Silpi Chakra at Freemason’s Hall, New Delhi. In 1956, 1959 and 1961 he exhibited solo, Jehangir Art Gallery, Mumbai. In 1962, 1963, 1969, 1971, 1972, 1978 - 1980, 1982, 1984 - 1986, 1992, 1993, 1996, 1998 - 2001, 2003, 2004, 2006, 2007, 2010 and 2014 he had solo exhibitions in various places in New Delhi. In 1966, 1967, 1969, 1986, 1989, 1990, 1993, 1994, 1997, 1998 and 1999 he exhibited solo in Mumbai. In 2003 his solo exhibition ‘K.G. Subramanyan: A Retrospective’ was held at National Gallery of Modern Art (NGMA) in New Delhi and Mumbai. In 2005 he had a solo ‘Recent Paintings’ at Jehangir Art Gallery in Mumbai. In 2006, he exhibited solo at Faculty of Fine Arts, Maharaja Sayajirao University, Baroda, Gujarat. In 2007 he exhibited solo ‘The Magic of Making’ at Lalit Kala Akademi, New Delhi. In 2009 and 2015 he exhibited solo at Nandan Gallery, Kala Bhavan, Santiniketan. In 2009, 2010, 2013, 2014 and 2015 he had solo shows in Vadodara, New Delhi and Kolkata. In 2014 he exhibited solo ‘New Works’ at India Habitat Centre and Art Heritage, New Delhi. In 2014 ‘New Works by K.G. Subramanyan’ was exhibited at the Government Museum and Art Gallery in Chandigarh. In 2015 he exhibited in UAE and Abu Dhabi. In 2015 and 2016 he had a solo travelling exhibition ‘Sketches, Scribbles and Drawings by K. G. Subramanyan’ at Jehangir Art Gallery in Mumbai and the Harrington Street Art Centre in Kolkata. In 1956 he took part in group shows in USA and UK. In 1961 and 1979 he participated in Sao Paulo Biennale, Brazil. In 1964 he participated in Tokyo Biennale. In 1964 he participated in New York World Trade Fair in New York. In 1964 - 1965 he took part in ‘Ten Indian Artists’ in USA and South East Asia. In 1965, K. G. participated in Common Wealth Art Festival in London and ‘Art Now in India’ at Lanig Art Gallery, New Castle. In 1968 he showcased in 1st international Triennale in New Delhi. In 1975 he participated in 3rd international Treinnale, New Delhi. In 1971 he exhibited in ‘Indian Art’ at Teran in Iran. In 1976 he took part in Menton Biennale, France. In 1980 he took part in ‘Indian Art Exhibition’ in Tokyo, Japan and Washington DC, USA. In 1979 and 1980 he participated in ‘Asian Artist’s Exhibition Part I and Part II’ in Japan. In 1982 he took part in ‘Contemporary Indian Art’ at Royal Academy of Arts, London. In 1982 and 1983 he exhibited in a group show ‘Six Indian Artists’ at Tate Gallery and Royal Academy of Arts in London. In 1982, K.G. showcased in ‘India: Myth and Reality’ at Museum of Modern Art, Oxford, UK. In 1984 and 1987 he participated in Kala Yatra in Bangalore & Karnataka. In 1987 he exhibited in Coup de Coeur in Geneva and ‘Festival of India’ in Moscow, USSR. In 1988 he participated in ‘Festival of India’ in Tokyo, Japan. In 1995 K. G. participated in ‘Seven Contemporary Indian Painters’ at Gallery le Monde de l’Art in Paris, France. In 1998 he participated in a group show in Singapore. In 2004, 2005 and 2006 - 2007 he showcased in ‘Edge of Desire: Recent Art in India’ at Art Gallery of Western Australia, Perth; Queen’s Museum of Art in New York and National Gallery of Modern Art in New Delhi and Mumbai. In 2005 and 2006 K.G. participated in ‘Cubism in Asia: Unbounded Dialogues’ at the National Museum of Modern Art in Tokyo in Japan; the National Museum of Contemporary Art in Korea and the Singapore Art Museum. In 2008 he participated in 'Moderns' at Royal Cultural Centre, in Amman, Jordan. From 2008 - 2011 he exhibited in Chennai, Ahmedabad, Mumbai, New Delhi, Spain, Singapore and San Jose. In 2013 - 2014 he participated in group shows in Kolkata. In 2014 he took part in 'Ode to Monumental: Celebration, Visuality, Ideology' at Lalit Kala Akademi, New Delhi and Jehangir Art Gallery, Mumbai. In 1956 he received the British Council Research Fellowship to study art at Slade School of Art (University of London). In 1957 he was awarded Governor’s prize at Bombay Art Society, Mumbai. In 1959 he received an award from Bombay Art Society, Mumbai. In 1961 he won the Maharashtra State Award and the Medallion of Honorable Mention at Sao Paulo Biennale, Brazil. In 1965 K.G. won the National award from Lalit Kala Akademi, New Delhi. In 1966 he received fellowship from J.D. Rockefeller III fund, USA. In 1968 he won the gold medal at 1st International Triennale, New Delhi. In 1975 he was conferred the Padma Shree by Government of India, New Delhi. In 1977 - 1978 he became a visiting fellow at Kala Bhavan, Visvabharati, Santiniketan. In 1980 K.G. was honored with Kalidas Sanman. In 1985 he became a fellow at Lalit Kala Akademi, New Delhi. In 1991 he was conferred Gagan-Aban-Puraskar by Visvabharati, Santiniketan. In 1992 and 1997 he received D.Litt. from Rabindra Bharati University, Kolkata and Benaras Hindu University in Varanasi. In 1993 he was conferred Fellowship from Kerala Lalit Kala Akademi, Kerala. In 1994 he was conferred Shiromani Puraskar in Kolkata. In 1999 he was honored Kala Ratna by AIFACS, New Delhi. In 2000 he received Jadunath Sarkar Gold Medal at Asiatic Society in Kolkata. In 2002 he was awarded Abindra Puraskar, Kolkata. In 2001 Government of Kerala awarded him the Manaviyam Ravi Verma Award and he received Gana Krishti Puraskar in Kerala. In 2004 he received Kala Ratana Puraskar by Lalit Kala Akademi, New Delhi. In 2005 he received Lifetime Achievement Award from the Academy of Fine Arts, Kolkata. In 2006 Government of India conferred upon him the Padma Bhushan. In 2012 he was awarded Padma Vibhushan by the Government of India, New Delhi. K. G. Subramanyan passed away in 2016.